Bali Ubud Tours is the best Bali Full Day Tour Package and very popular Bali Day Tours in Bali Islands for a Full Day Journey to Visit Tourist Destination and other interest places in Ubud Village the center art and culture in Bali islands. Ubud is a town on the Indonesian island of Bali in Ubud District, located amongst rice paddies and steep ravines in the central foothills of the Gianyar regency. One of Bali's major arts and culture centres, it has developed a large tourism industry. Ubud is being one of the famous village most visited in Bali islands due this village offered with many kind beautiful art, myth, and history. Is perfect tourist destination for those who love with Art and Culture history. This Ubud Tours will visit places of interest such as Watching Barong Dance performance tells the story about battle between Barong and Rangda, visit Celuk Village is a traditional village for the incredible gold and silver handicrafts, Ubud Batuan Village is a traditional village with beautiful fine art handicrafts, Ubud Tegenungan Waterfall is waterfall located in kemenuh, Ubud village, is one of the waterfall not situated in the mountain, Ubud Tegallalang Rice Terrace is famous tourist attraction for beautiful rice terraces and small valey, Ubud Monkey Forest is a small rain forest dwelt by some group of monkeys and other tropical animals, Ubud Royal Palace is an ubud kingdom palace with beautiful Balinese traditional houses as a residence of Ubud King and visit Ubud Art Market is a traditional art market in the center of Ubud village. Enjoy Ubud Tours packages with the professional and friendly Bali Tours Driver Service during your holiday by perform excellent services to make Ubud Village journey is memoable one for you and family. 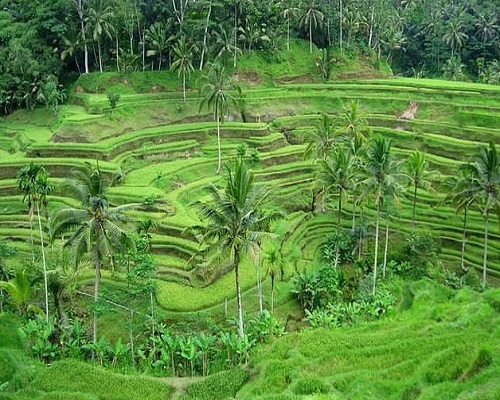 Below is a short description about the place of interest you will visit during Ubud Tours.